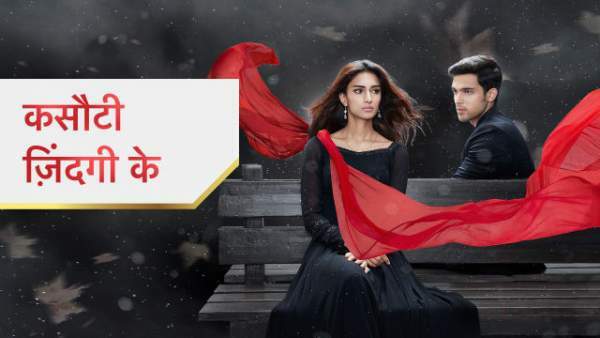 The written update of Kasauti Zindagi Ki 11th February 2019 episode of Star Plus TV serial. The episode begins with Prerna going outside the Basu’s house in tears. She is crying badly, but Anurag comes there and gives her a hanky to wipe her tears. She says that she didn’t do anything. He says that he knows about her. He questions her if she loves her family! She replies that it is such a stupid question and obviously she loves her family. He says that’s how the situation is and whatever Nivi and mom said to you was out of emotions. He says that when the family is at stake and, especially in the case of parents, then people get a little emotional. He says that Nivi sister is short-tempered and you know it. He says that Nivi will soon realize her mistake. He adds that it is a similar situation like when you had said a yes to marry Naveen Babu without even thinking about anything because he said that he will act as a supporter of her family. He says that you should have talked to me about this and I would have taken care of your family but she liked Naveen. She says that thank god there’s a huge difference between that Anurag Basu and the present one. She asks would you have agreed then? He says that to be honest, he won’t. He wipes her tears on his own and gives the hanky to wash and return back. He says that he already has the last hanky which is marked with her kohl so gives this to her. She asks that he didn’t give it to the laundryman? He replies that apart from the hanky, he has kept many other things also where he has the token of her love. Anurag makes Prerna smile, but Komolika is watching all this. Komolika says that she will make Prerna realize the gravity of her mistake. Prerna is going inside, but Anurag holds her and says that meet him at 3’o clock. Prerna leaves and Anurag recall him that meet at the proper time. Komolika gets irritated and goes to do something with her bad intentions for Prerna. Vinita is looking at her daughter-in-law who is busy with her household works. Suman asks for some tea to her mother-in-law. Vinita hugs Suman and says that she rebuked her a little too much. Vinita says that Suman sometime does something which puts her off, but she loves Suman as much as she loves Prerna and Shivani. Vinita adds that if someone says anything bad about Suman also, then she won’t sit quietly. Vinita says that she knows Suman loves everyone so much and she is like a daughter to her. Vinita asks for an apology from Suman. Suman says that don’t talk like this and hugs her. Suman is thinking that she’ll wait for the day when Prerna or Shivani make any mistake and then she’ll talk to her mother-in-law. Komolika comes inside Mohini’s room, but Mohini is sleeping. Komolika thinks that this is a great time as Mohini is alone. Komolika knocks and says that why is she alone and no one there with her? Mohini replies that she was feeling a little anxious, so she sent everyone out. Mohini asks Komolika to come and sit with her. Komolika says that she feels very strange and nervous and it could be due to the fact that she lost her mom in her childhood. It made her completely alone and know a mother’s value more than anyone else. Komolika says that she was worried if something happened to Mohini. Mohini asks why she is so much concerned about her? Komolika replies that it is the first time in her life that she’s seeing her mom’s image in somebody which is Mohini. Komolika says that now Mishka and Anurag are also not together and she doesn’t know about their relationship, but she has found Mohini as a mother in her life. Komolika asks to regard her as a daughter from Mohini. Mohini is happy to see this. Komolika says that she thinks Prerna didn’t do everything in a mistake. Mohini says that she agrees with her as her father is also having a heart issue, so she would have got to know about me by looking at all the symptoms and did all this on purpose. Moloy is standing outside and listens when Komolika is saying that Prerna did everything intentionally to harm Mohini. Komolika says that Prerna is scared from Mohini that her future plans didn’t get spoiled. Mohini thinks that Komolika is right about Prerna since Prerna is scared to lose Anurag in her presence. Mohini says Moloy to come and he enters with the juice. Moloy leaves, but thinks to stop Komolika. Mohini is asking Komolika about her feelings towards Anurag. Komolika starts blushing. Mohini says that Komolika doesn’t need to say anything as her face is revealing everything. Mohini says that let her get recover and she will fix everything. Nivi’s diamond bracelet is lost and she is scolding a servant for it. The servant replies that she doesn’t even know anything about it. Moloy asks Nivi to come down and says that these servants are their helper. Nivi leaves saying that give her the bracelet. Moloy calms his servants down and asks to find the bracelet. Moloy says to Anupam that he has placed CCTV cameras in the kitchen. Moloy is checking the CCTV footage and gets to know that Komolika has mixed something in Mohini’s food which Prerna was serving. Moloy gets to learn that Komolika did so wrong just to put Prerna down. Precap: Moloy slaps Komolika and shows her the CCTV footage. Vinita looks at Prerna getting close to Anurag and slaps Prerna. Komolika plans something bad for Moloy!